The Daily Mail has reported that Britain’s oldest stunt pilot Doug Gregory has reluctantly given up aerobatics at aged 90, but insists he will continue to take to the skies. 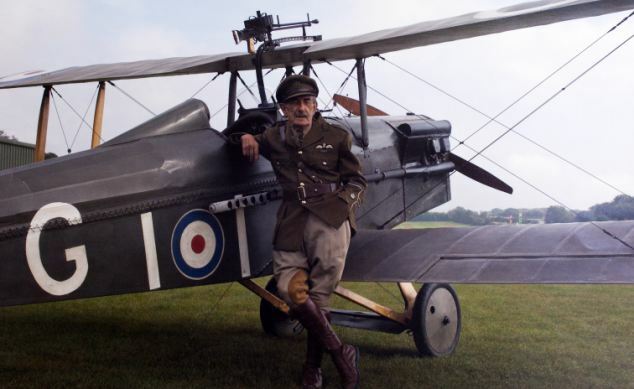 The 90-year-old former RAF and commercial pilot also plans to sell his homemade 1917 replica stunt plane because it has become too difficult to operate. The aircraft costs just £5,000 pounds to build between 1983 and 1987. The former school teacher has now been flying for over seven decades and still holds all the relevant licenses making him one of Britain’s oldest pilots. He plans to continue flying every week – including over to France to attend World War I memorials. Apparently, Anthony did the stunt one other time 25 years ago. This time around, it took him thirty second to pick the locks (something he started learning to do when he was only six years old) and escape, but it wasn’t easy because the plywood casket whipped wildly from side-to-side and he also struggled to open the door. Everyone involved in the stunt did land safely with no serious injuries. However, one of the skydivers ended up with a fat lip and a scraped arm after being slammed into the door of the plane as they exited while trying to steady the box. So what was the point of Anthony’s stunt? To sell his new book entitled, “Escape or Die: An escape artist unlocks the secret to cheating death,” which chronicles his four-decade long career as an escape artist.